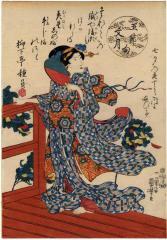 The quote above the bijin is by Ryūkatei Tanekazu (柳下亭種員: 1807-58). His name is shown along the left side with his seal. "Tanabata [七夕] originated in the ancient traditional belief that the Star Weaver which separated by Ama-no-gawa (Heavenly River) or Milky Way from her lover, the Altair, all the year round, meet once a year round meet once a year on the evening of July 7. Also it tells that Japanese women worshiped the Weaver as weaving was one of their most important household tasks in early days. Thus it is primarily a girls' festival. But since it became a national event in the seventh year of Tenpyo Shoho or 755, it has been most elaborately observed by all the people through 10 long centuries. The romantic belief that the Weaver and the Altair met only once a year appealed to the imagination or the sentiment of young girls. For the success of their own love they eagerly prayed at the festival. Also they prayed that hte evening would be fair in weather, as they thought that, if it rained, the Milky Way would be flooded and the two stars would not be able to meet." Quoted from Mock Joya's Things Japanese.